Last evening I sat on the porch of the Sullivan house overlooking Silver Lake here in central Florida watching silver-streaked waves sparkle as they were buffeted by a slight wind, and I overheard a strange trumpeting noise. I looked up and saw two sandhill cranes, their long bills outstretched as they talked to one another in low pitched harmony on a walk at the edge of the lake. They seemed to have some strange kind of disconnect from their environment and deserved a photograph by Vickie Sullivan who often snaps photos for this blog (see the intriguing photo above). The two cranes on the beach are actually of concern to lovers of wildlife but aren't among 5,000 of an endangered species in the U.S. — yet. The oldest of these elegant birds in the U.S. is 36 years, and I assume it is still performing his dance with his mate (although he may have experienced the loss of the one with which he mated for life). 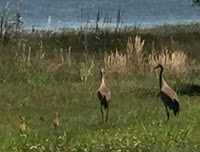 When we went indoors and mentioned the birds to Vickie's mother Inez, who is in her late 90's, she said one word: "family," and I was told that the cranes have a family close by. Baby cranes follow their parents around for nine months before they're declared an adult. If you look closely at the picture on the left, you can just discern two little ones loping beside their mother. 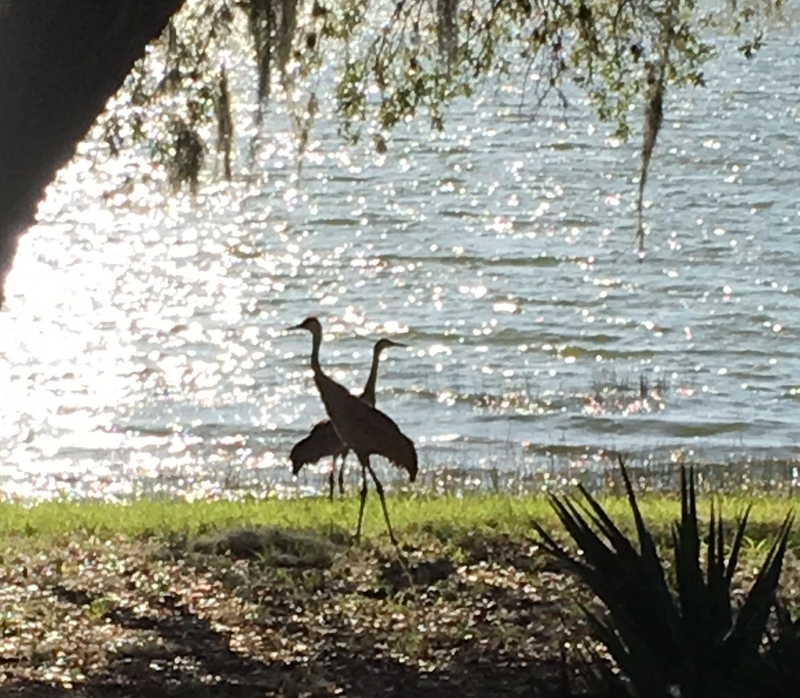 The crane twosome at Silver Lake were enjoying an evening stroll, perhaps foraging for berries, insects, or snails… and are also prone to eating reptiles – lizards, snakes, and the like. However, they, in turn, can be devoured by crocodiles and alligators that, fortunately, don't inhabit Silver Lake. If disturbed, their defense against such predators is to hiss, jump in the air, and kick at their attackers. I watched the couple stride on the beach for a few moments, wondering how old the cranes were. To me, their slow bobbing walk, with legs bent backwards at the knees in contrast to human legs, resembled that of elderly humans, but they carried themselves with unusual grace. 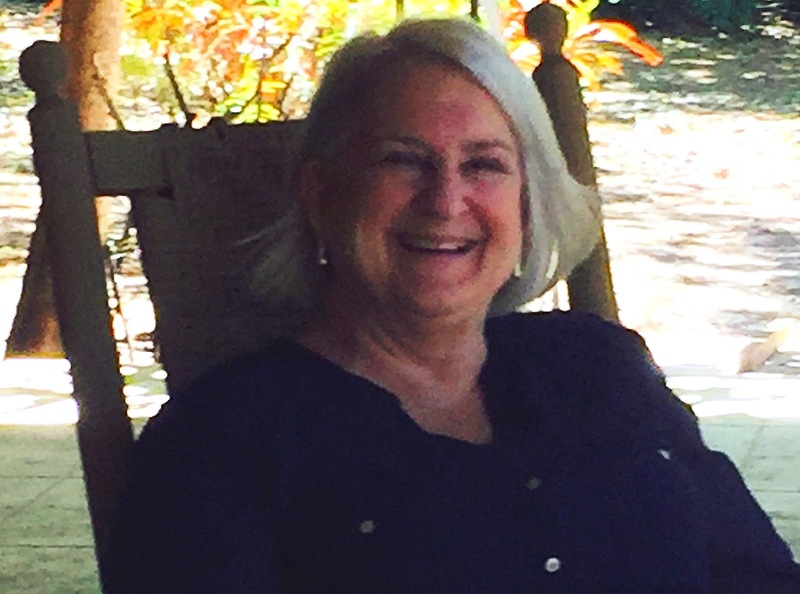 life, and I call for the photographer to record a scene to add to the memories of Florida lake country. Porch sitting is a pastime in this part of the world, and I've been part of it for the 39 years I've visited here. Several tall rockers, a wood swing, and an overhead fan attest to this relaxed southern way of life. The Sullivan porch has been occupied most of our week-long visit where we've been catapulted into the midst of this long-legged wildlife and have experienced our own "disconnect" from concentrated thinking for a spell.